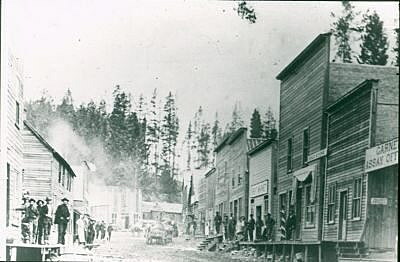 Garnet Ghost Town is a popular tourist attraction. The historical site, just northeast of Missoula, attracts 16,000 annual visitors who are fascinated by Montana’s mining history. The BLM oversees the site assisted by volunteers from the nonprofit Garnet Preservation Association, which is “dedicated to protect and preserve” the remnants of the town. There are many great resources available today for anyone wanting to know about Garnet’s history. I’ll list a few of them (links) a bit later. My interest is old Montana newspapers and the insight they provide on Montana’s early days. Among the rolls of microfilm of old newspapers is a gem: the Bear Mountain News. We’re lucky we have a copy of that paper. It’s the smallest microfilm I’ve found so far – just four images, a single edition, the paper’s first – donated by Mrs. C. E. Dobson to the State Historical Society. Only 500 copies of the newspaper were printed (at a press in Missoula) and were distributed free in the Garnet area, by hand, to drum up subscriptions. Beginning in the summer of 1897, there was a building boom in the mining camp at the junction of Williams and First Chance gulches. 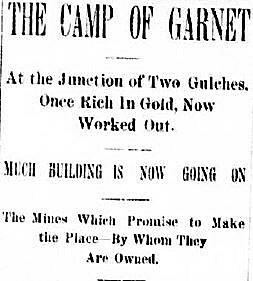 The paper pegged the population of Garnet at over 300 by early 1898, a result of the successes of the “Nancy Hanks,” the “Shamrock,” the “Spokane,” and other nearby gold and silver mines. With that growth, the Bear Mountain News said it was time to transition from a “camp” to a “town” and called on locals to do their part. The paper urged everyone to give thought to municipal planning. “Between the upper and lower part of town, which is about a quarter of a mile, there is a continuous line of houses used for dwellings, etc. They, like the rest of the town, are built without any regard for street or neighbor,” wrote the paper. The paper’s first priority, though, was to “secure a daily mail route to Garnet and Coloma,” both for the public good, and as a distribution method for its product. That first edition featured an article on the genesis of Coloma, also known as Washoe, located in the Bear Mountain Range, just north of the Granite County line and a couple of miles east of Missoula County. The area had first been mined in 1868. The twenty foot shaft of that original mine still existed 30 years later, said the Bear Mountain News, but it never was productive, so miners had transitioned to easier placer work. In the 1890s, though, new interest developed in the Washoe-Mammoth area and a few claims “proved themselves of value.” By early 1898 “fifty-six men were on the payroll of the company” running the Mammoth mine and 150 people were living in the vicinity. The Mammoth workers constructed their own gathering spot near the mine, a 20 by 30 foot log building “comfortably warmed and provided with tables, chairs, reading matter and writing material, besides games of checkers, chess, cards and other means of amusements, the only restriction placed upon those who use the privilege extended is that no gambling takes place in the building.” The Mammoth company also provided its miners with a 400-book library. In addition to the Mammoth, other mines near Coloma included the “Clemantha,” the “Valley,” the “Rambler” and the “Crystal Spring” lode. Colomaites held fundraisers to support a local school, which by early 1898 was filled to capacity with “young ideas,” so locals were looking for a new, larger schoolhouse. The Mammoth Mercantile of Coloma offered “miners’ supplies, hardware, fuse and powder” in addition to groceries and dry goods. In contrast to the picture painted by the Bear Mountain Newspaper, the BLM/Garnet Preservation Association believes there were 1,000 residents of Garnet in January of 1898 (not 300), although Maria Craig at the BLM office in Missoula wasn’t sure of the source of that number. Those residents, no matter their actual number, originally named the mining camp “Mitchell” (after Dr. Armistead Mitchell, who financed a mill to crush ore in 1895) but a couple of years later, when the locals requested a post office, they found the name “Mitchell” was already taken, so they proposed “Garnet” after the gem stone they often encountered while mining for gold and silver. All accounts agree, though, the mining camp was built haphazardly with no planning or coordination, and the buildings were not meant to last – most had no foundations. Given that, and a fire in the early 1900s, it’s actually amazing that so many buildings remain. 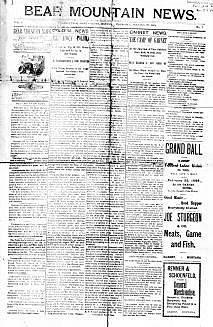 If you’d like to read the entire, four-page January 27, 1898 edition of Bear Mountain News, you can find it at missoulahistory.com (a site I’m beginning to build). Jim Harmon is a longtime Montana journalist who writes a weekly history column for Missoula Current.